Quiches agree excellent whenever you have way too many eggs. I always had a problem with eggs and how they were cooked growing up. I was always grossed out by the over-cooking and burning. Somehow the pan smell always made me sick. Fortunately, I got over it after I started cooking my own eggs in college. Now I love eggs! I use them in everything and cook them by themselves in yummy butter. Butter! Butter and herbs. So good. I recently got into quiches and the possibilities are endless! 1. You need eggs of course – you can use from 4 to 10 of them depending on whatever other liquids you choose to put in. For example, use less eggs when you use more cottage cheese, sour cream, or cream cheese. Eggs are the binder. 2. You need a dairy product. It makes it taste divine – but it’s not necessary if you are vegetarian or lactose. You can use plain milk, cottage cheese, sour cream, cream cheese, cream, half and half, whipping cream, or whatever you fancy! You can mix and match for different favors. Up to two cups. 3. You need additions. Leftover meat bits from last nights dinner, cubed sausage, breakfast sausage, bacon, chopped deli meats, herbs, spices, salt, pepper, vegetables (spinach, onions, garlic, bell peppers, etc). 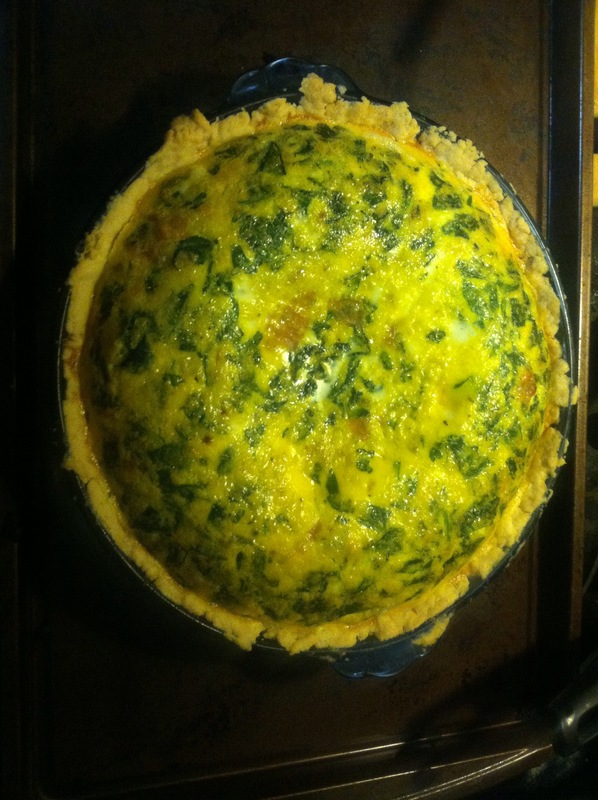 *make sure that the meats are pre-cooked and vegetables/herbs are cooked together as well before putting in quiche. There really isn’t a limit on additions-as long as it doesn’t overflow the pie plate! 4. You need cheese – can go from 1 to 2 cups. Any cheese you would like. Basic directions are whisk eggs in a large bowl. Cook meats and/or veggies and add to the bowl. Add dairy products, cheese, and whatever else to the bowl. Put into a pie plate that has a crust in it and bake at 375 degrees for 45 minutes. Don’t overfill the plate – if you think it will overflow, put a cookie sheet under the plate when you put it in the oven. If it is still jiggly after 45 minutes, cook until jiggles are minimal. Pie crust: Take 1 stick butter and cut into tiny cubes. Put into pie plate and Add 1 1/4 cup flour. Use hands to incorporate the two together until it is almost a cornmeal consistency. Add ice water until it forms a ball (if too sticky, add more flour. If too dry, add more water). Press into pie plate until all sides are covered! Fill with quiche filling! I make quiches all the time because of all the eggs the chickens give. Today I made one with 10 eggs, 1 cup milk, sautéed onion, garlic, basil leaves, and spinach leaves that were in butter, with 1/2 cup Parmesan, 1/2 cup Italian blend, salt, and pepper. Posted on August 15, 2014 September 26, 2016 by MichellePosted in RecipesTagged quiche, quiche recipes, quiches.